Why Chinese New Year Is The Best Holiday Ever. Chinese New Year can be referred to as 农历新年 (nóng lì xīn nián) or "Agricultural New Year", or more commonly 春节 (chūn jié) or "Spring Festival." It’s bigger than Mardi Gras. It’s bigger than the 9.3 billion-dollar Chinese holiday, Singles Day. It’s even bigger than Christmas in the U.S.
Because instead of presents, you get money. 拜年 (bài nián) is the term “to wish [someone] a happy new year.” Many younger children will be taught to “磕头 (kē tóu) ”, or bow before elders as a sign of respect. 磕头 specifically refers to “touching the head,” which means the children will often touch their forehead to the ground in front of their elders. After doing so, they may receive their 红包. A child demonstrating "磕头" for a red envelope. 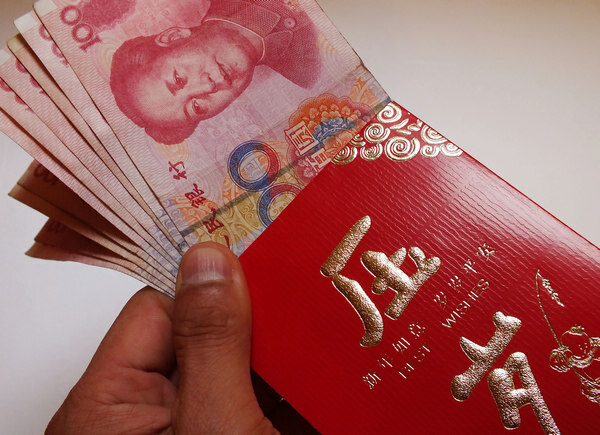 Chinese New Year is about more than receiving “红包”, however. This 5,000-year-old celebration is a time for families to reunite, eat, drink and make merry. 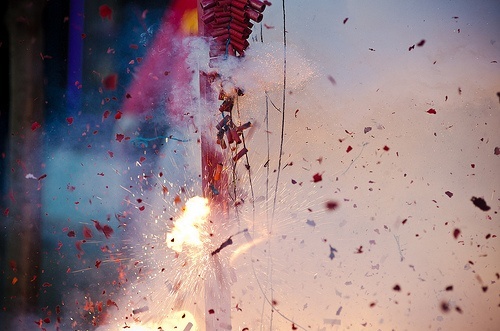 Common traditions include setting firecrackers and hanging red decorations. These traditions have their roots in mythology. It was believed that “Nian” (the word for Year) was a giant monster that would devour livestock, crops and even children. The villagers soon learned that Nian was afraid of the color red, and of loud noises. To protect themselves, they hung red paper cutouts on the houses and lit firecrackers to scare it away. It’s tradition to hang up intricate, red paper cuttings on windows. Lion Dance performers must be acrobatic. 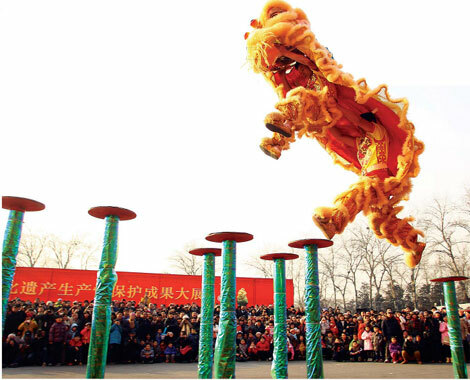 The Lion Dance is usually comprised of two peoples in a colorful lion suit (one in the head and one in the body.) Because loud noises are thought to scare away the Nian monster, the Lion Dance is accompanied by cymbals and gongs. The challenge is often for the lion dancers to pick apart a lettuce head (often suspended on a very high stick for difficulty) to get the red envelope inside. The 红包 is a reward for the dancers. Every year, CCTV (China Central Television) will put together an evening gala or show that is broadcasted to over 700 million viewers. 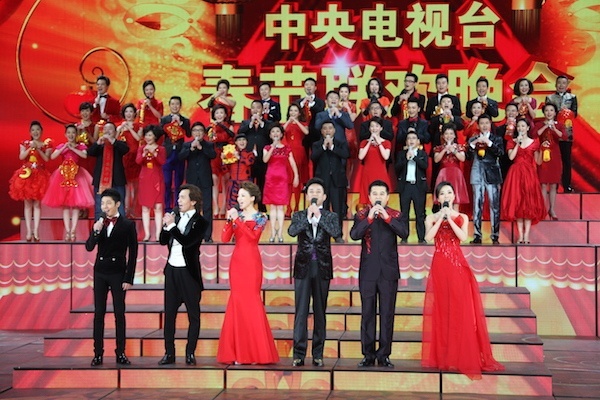 The name of this program is abbreviated to 春晚 (chūn wǎn) or “Spring Evening.” This show includes celebrity performances, stand-up comedy, dance performances, and more. As you can tell, Chinese New Year is filled with colorful traditions and customs. 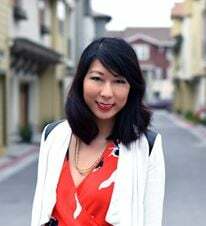 When asked to describe what Chinese New Year is like, one could say that it’s a mashup of the U.S holidays of Christmas, New Year’s Eve, and Thanksgiving. 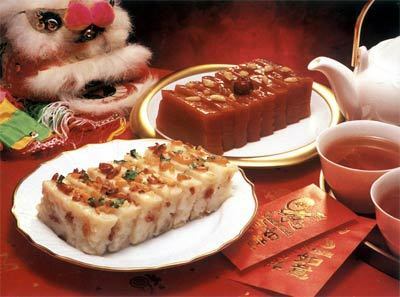 And just like Thanksgiving, there are a lot of traditional foods that are eaten during Chinese New Year. 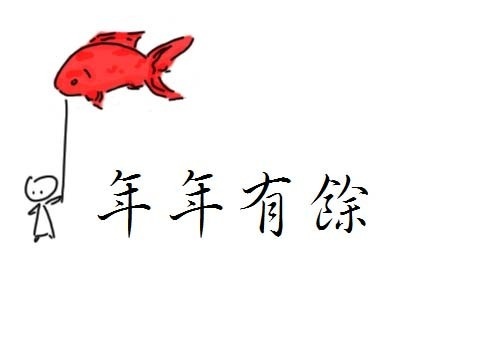 A popular saying during Chinese New Year is “年年有余 (nián nián yǒu yú) ” which translates into “Extra [money] every year.” The word “余” has the same pronunciation as “鱼” which means “fish.” Because of this, eating fish is thought to bring prosperity. One of the most commonly eaten foods during Chinese New Year, dumplings are thought to be lucky because they are visually similar to gold ingots used during the Ming Dynasty. 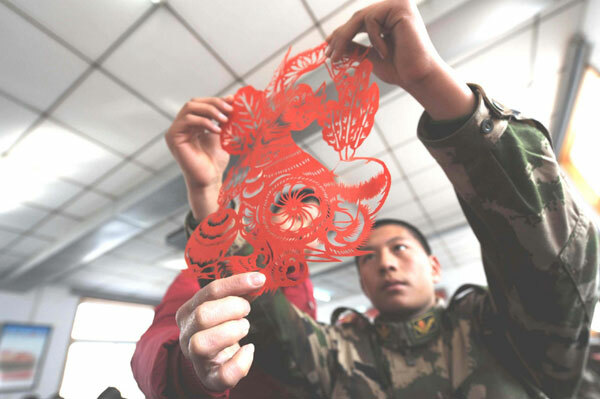 Many Chinese families will gather together on Chinese New Year’s Eve to wrap 饺子 (jiǎo zi) together. The name of the food, “年糕 (nián gāo)” sounds like “年高 (nián gāo)” which suggests a year better and more prosperous than the last. The word “高” means “high, increasing” and is a lucky word, especially for those hoping for a promotion. We hope that you found this blog post helpful! On behalf of TutorMing, Happy New Year! We hope you have a wonderful new year.